While sprucing up the guest bedroom I was looking for a quick, easy, cheap and great looking headboard idea. I didn’t find any inspiration online that I wanted to execute on but I did find a box of click together, glueless laminate flooring in the basement that the previous home owners left behind and knew it would work perfectly for what I needed. 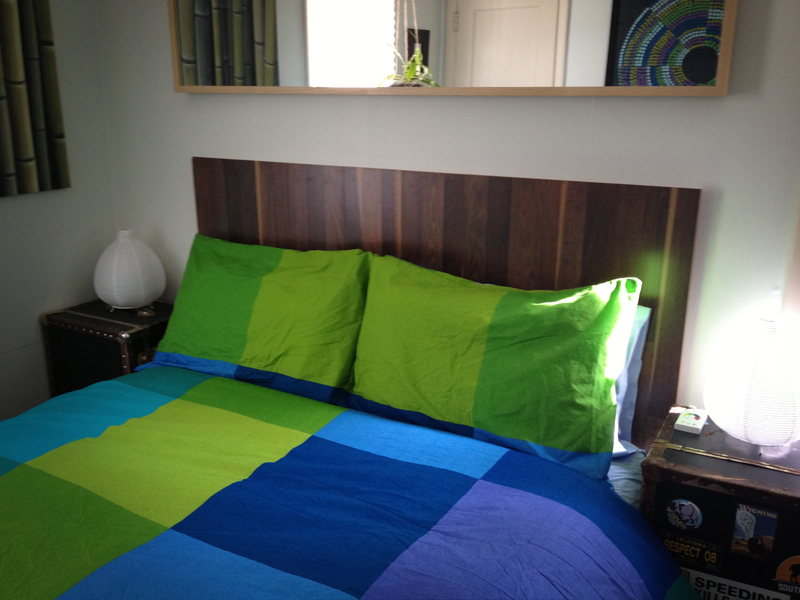 For a double bed it only took 8 pieces, about half of the box and no glue, nails or cutting. I literally just snapped the pieces together. The whole headboard rests on the floor and is held in place by the weight of the bed. For more depth and a little something extra I added 1″ X 1″ ledger boards on the back and threw an extra set of Ikea LEDs behind it for night-time ambiance. You could also mount it higher on the wall on a ledger board for a more dramatic look. You can purchase this product or similar products at most home improvement stores and I found the same product at Home Depot for $22 a box. Cheap, quick and great looking. My kind of project. Here is the final product. Apologies for the hiatus in posting. I needed to take a break from projects as I was preparing to move. I recently completed my trip from San Diego to Minneapolis and am now living in a house with my boyfriend so you can expect to see more fun projects soon. This project was inspired by the trend of pixelation as pattern on art and accessories. We were looking for a way to spice up the boring white fence and wanted to tie it into the house and make it visually more appealing. The best part about this project is that the boards are mounted onto the fence with just a few nails so you can take it down and with you if you move. It’s only semi permanent. 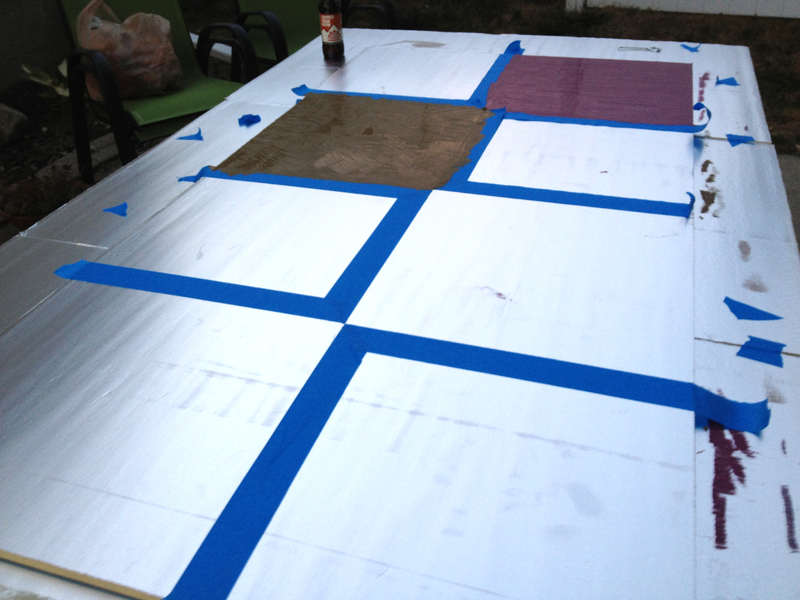 We used Dow Polystyrene Insulation Board which runs about $15 for a 8’X4′ sheet. Home Depot can cut it down for you to any size without additional charge which is convenient since I don’t normally drive a flatbed truck. This is the material after it was cut down. We ended up with the remnants of the boards too which I’m sure we can find a use for. 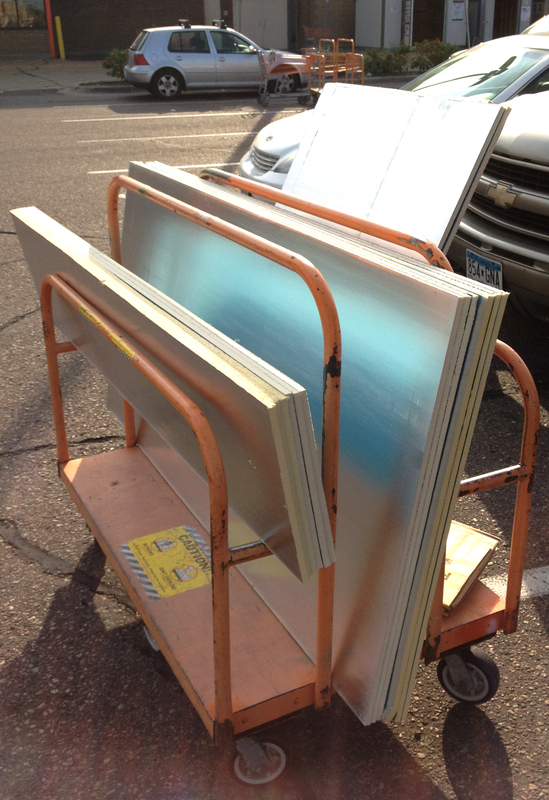 Prior to purchasing the materials we picked out 8 paint colors as there are 8 squares per panel. We chose exterior latex over enamel since it can have a tenancy to eat styrofoam. 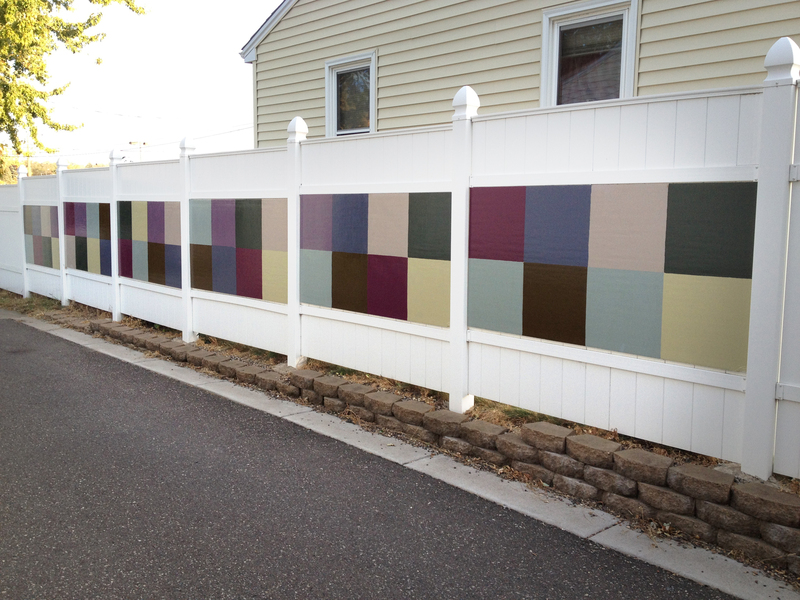 We stuck to exterior paint colors in an attempt to not piss off the neighbors with too wild of an installation. From there we taped off every other square and then painted the remaining squares by hand once those were dry since we were concerned about the tape pulling up the fresh paint. We might have opted to prime the surface since it is a foil like material. This was all trial and error since we had never used this material but found that two coats was adequate with a little additional touch up. We finished off the boards with exterior polyurethane to help them weather the elements a little better.